Earlier today, I somehow ended up on the Newsweek website and read “How DC is Nixing a Cancer Cure” http://www.newsweek.com/id/70301 and I suggest that you do too. Tonight I found out that a dear friend of mine lost his battle with lymphoma. Fred and I went to college together and I will always remember him as pictured here. 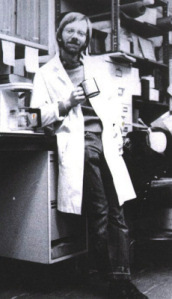 Coffee cup in hand, lab coat, and a smile. Fred was the mother hen of the small group of friends I had in college. He cared about all of us and was always there when you needed him. We used to sneak into campus buildings and explore the off-limits attics and basements. We’d joke about fencers (he was one and I wasn’t) or my odd taste in music (the laugh was on him, when he decided he liked the Jazz Butcher Conspiracy and their use of a typewriter as an instrument). He even contributed to my roommate and I’s mad plan to collect soda cans for some secret project… which turned out to be a wall of cans that we taped in front of his door late one night. He was greeted the next morning by the smiley face we patterned into it. After college, Fred stayed in touch. Our whole little circle scattered into the wind, but Fred would always check in. First Delaware, then Chicago, and finally in New York. We attended one another’s weddings and saw one another very infrequently after college. We threatened a few times to get together up in Binghamton, but one reason or another kept that from happening and it was usually my fault. He called me earlier this year to let me know that the doctor’s found something in suspicious in his test results. We had a long talk that night and then I heard nothing for a while. When I finally reached him I was beyond concerned, but he said that the treatments had taken a lot out of him and things were finally getting better. He was heading back in for a second round, so I wasn’t to worry if I didn’t hear from him soon. A short while later, I heard that he had been moved to a hospital in Buffalo. The lymphoma had spread to his brain. I never did get to speak to him again. Goodbye my friend. You will be missed more than you imagine. Condolences. I don’t know what else to say. I’m very sorry for your loss. And utterly appalled by the idiocy that keeps cures from becoming reality. I’m now about to criticise that article slightly, so look away now if that will bother you. As it happens I have been reading up on treatments for indolent NHL (specifically follicular lymphoma) this week, for my day job. The basic situation seems to be that up until about ten years ago there really wasn’t much; then rituximab came along, which dramatically improved both survival rates and the length of relapse before disease progression and death; and since then there have been a bunch of new treatments and combinations. Still, RIT does get a good PFS in some studies; the catch is neither it nor anything else has dramatically increased overall survival. You’ll note that the author glosses over this by saying we “won’t know for sure” for a few more years; that’s a bit like saying that 15-year follow-up data on rituximb might reveal a better effect on survival than we think it has at the moment. Moreover the article glosses over the side effects of RIT — “fewer immediate side-effects than many conventional chemo drugs” is when you think about it a pretty weak claim (long-term side effects, anyone?). The economic points made in the article are stronger, but unfortunately the reality is that some treatments are too expensive for the benefit they offer. However, so far as I can tell it’s not clear whether or not RIT is one of them, so I agree it’s a mistake for CMS to change the reimbursement of it. RIT is an option worth having on the table, but I am far from convinced it’s the wonder-therapy that article paints it as. I did some further research after reading the Newsweek piece, figuring I’d ask Fred if they’d considered trying it on him. More often, I saw it described as a promising new treatment, not the big cure we’re all hoping to see someday. I suspect you are right about long-term side-effects. They do gloss over them, but have they had the time to identify them? It’s hard to say from anything I’m reading, but this is way outside my field of study. I have not yet seen a convincing argument from any perspective that would explain the 50% cut in reimbursements that the CMS will have in place for 2008. As a result, I firmly support the attempts to have levels restored to their 2007 numbers. Sorry to hear this, Fred sounds like a great guy. Thanks. Yes, he was. One of the best. Yeah, this news rocked me too. I have no words. I think it’s the first time I’ve ever had someone I knew that well (outside of older family members and the like, the kind you expect to die before you) die. Though we did email occasionally, I hadn’t heard from him in years, unfortunately — given how we broke up, I was never sure he wanted to keep in contact. I’ve lost a few people my age or younger, but this one was a big kick to the head. Over the last few days, all sorts of things have been coming back to me that I haven’t thought of in years. I just start laughing and then go quiet. You both ended up with people you love. Fred never gave me the impression that he was still harboring ill feelings about what happened. In the end, it was for the best of both of you. Yeah. We really weren’t suited to each other in that way — we should just have been friends. I’m sorry he’s gone; he was a good person. I wish I’d stayed in contact more.